Today my husband and I drove from Dallas, Texas to Austin, Texas. We decided to stop for lunch along the way and saw a sign for a steakhouse, so we thought we’d give it a try. 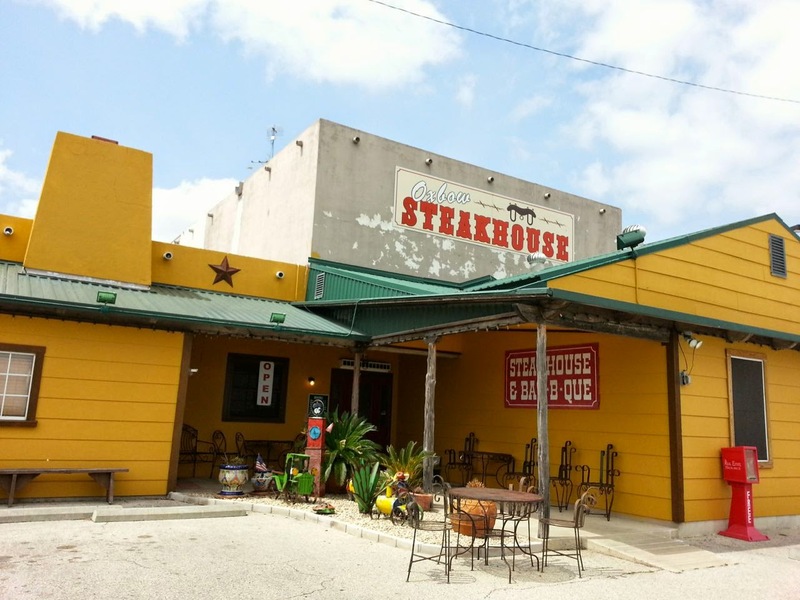 We walked up to Oxbow Steakhouse & BBQ and noticed that the hours by the front door indicated that they’re only open for dinner; however, the sign said “open.” We pulled open the door and asked the hostess if they were open. She said they’re usually not open for lunch but that they are today. Not sure why they were open, but it worked for us! The restaurant was empty. We were seated and brought menus. My husband wanted a steak and thought about ordering the ribeye, which according to their menu, is their specialty. I glanced over the menu and noticed the Ribeye Sandwich, which I pointed out to my husband, and he decided to order that instead. It’s topped with provolone cheese and grilled onions. He ordered it cooked medium. It came with his choice of chips of fries, and he chose fries. I wanted a salad. I almost always want a salad. At home, I eat a salad everyday, so when I’m eating out, I feel the need to have at least one salad everyday too. I decided to order the Loaded Cobb Salad which is topped with tomato, boiled egg, bacon, cheese and your choice of chicken or steak. I chose steak and ordered it cooked well done. I also asked for ranch dressing on the side. 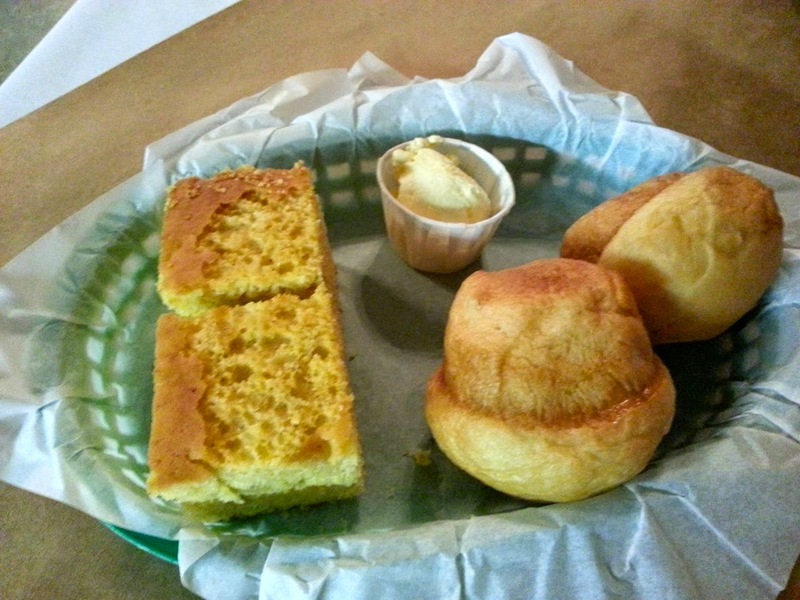 While we were waiting for our meals, the waiter brought out cornbread and dinner rolls. The cornbread was crumbly and pretty good with some butter on it, but it would’ve been better if it had honey in the mix. The dinner rolls were kind of dry, but they were okay with butter (what isn’t?). So, what did we think of our meals? 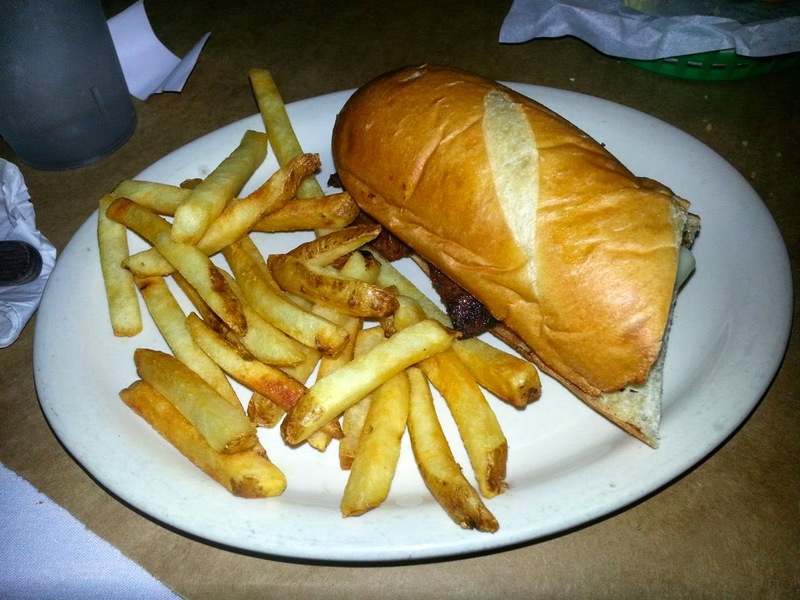 The steak on my husband’s sandwich tasted like it was cooked well done, not medium. There was zero pink. It was a little dry. If ribeye is their specialty, we weren’t impressed. The sandwich could’ve used some sort of sauce or something on it to make it juicier. The fries were okay but nothing special. My husband dipped them in steak sauce. 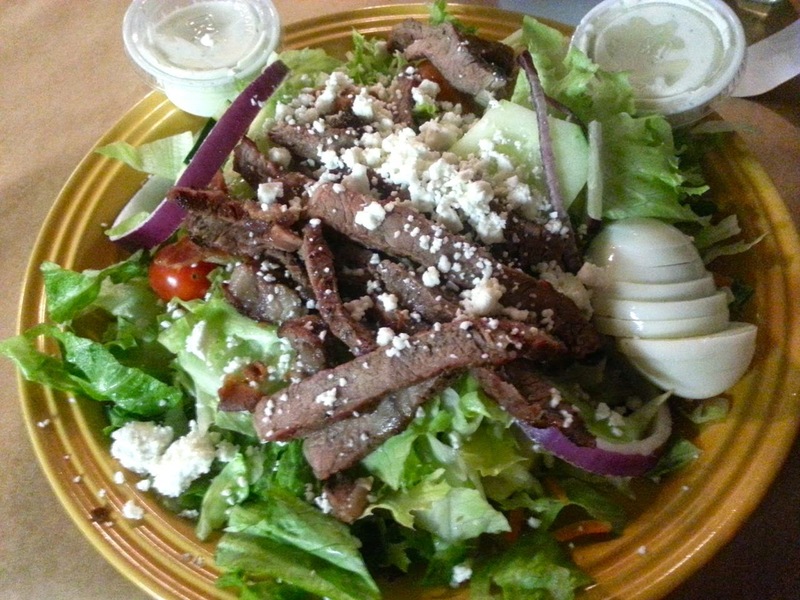 The steak of my salad was a little fatty, but it had a great flavor. The salad wasn’t super big, but it tasted good. I’m not sure what type of cheese was on it, but it seemed kind of like feta. It was good, but it wasn’t what I was expecting. I was expecting something more like cheddar. In short, I don’t think we’d stop at Oxbow again, but it was a filling lunch.